As many of you are aware, the Adoremus National Eucharistic Pilgrimage and Congress is taking place in the city of Liverpool from 7-9 September. The event is to be attended by all of the dioceses of England and Wales and will be centred on Holy Mass, Eucharistic Adoration and Benediction of the Blessed Sacrament at the Liverpool Echo Arena. 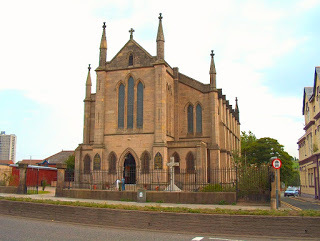 A good and wholesome fruit is the provision of extra Traditional Latin Masses, at Liverpool's famous and beautiful St. Anthony's church on Scotland Road, during the period of the congress. One of the encouraging things about Catholic and cultural life in Liverpool is that, when travelling on buses along Scotland Road - ''Scottie'' in Scouse parlance - one still sees passengers reverently making the sign of the cross as the bus passes by the front of St. Anthony's Catholic Church. Thanks to the hard work of the local LMS representative, Mr. James Pennington, the generous priests and altar servers on the rota, as well as other supporters, there is normally a Traditional Latin Mass every single Sunday of the year at St. Anthony's at 3pm; with Traditional Latin Masses also normally offered there at 12 noon on each of the Holy Days of Obligation. Friday, 7th Sept: 9:00am - Low Mass. Saturday, 8th Sept: 9:00am- Feast of the Nativity of Our Lady - Missa Cantata. Sunday, 9th Sept: 3pm - Asperges, Missa Cantata, Benediction of the Blessed Sacrament. The address for sat/navs is St. Anthony's Catholic Church, Scotland Road, Liverpool, L5 5BD. This is a tremendous opportunity for regular attendees, visitors to the Congress and anyone else who is interested in learning more about the treasures and beauty of the Traditional Liturgy and Faith, to attend and support local priests and people of the Archdiocese of Liverpool, in keeping those Four Ends of the Mass: Adoration, Thanksgiving, Reparation and Petition. Don't miss this important opportunity! St. Anthony - Pray for us!